A standard cinder block can serve a purpose far beyond construction with nothing more than a bit of time and well-placed paint. Sturdy, durable and already sectioned off into two parts, a cinder block is the ultimate material when it comes to organizing a desk or office space. 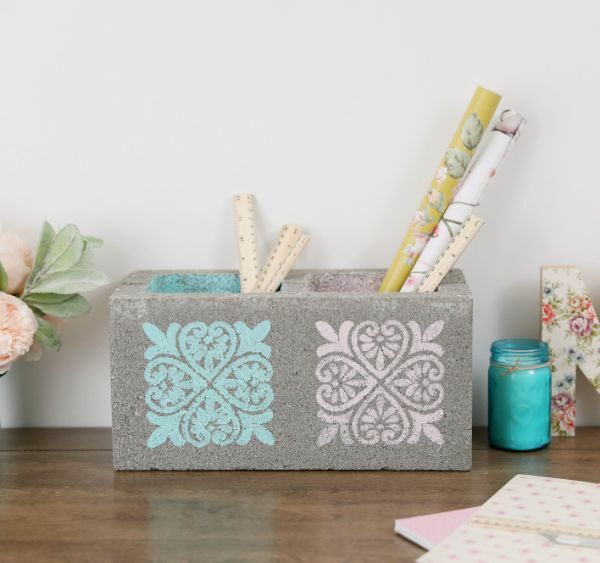 Creating a cinder block desk organizer is a simple way to combine rustic appeal with a feminine touch. Adding a decorative paint stencil to the more neutral concrete hue quickly creates a unique contrast that stands out in any room. Adults should handle the bulky cinder block, but kids will have a wonderful time contributing to the paint stenciling when this becomes a DIY family project. A cinder block desk organizer works well in a home office but could just as easily help keep a child’s room clean and convenient to find smaller items that tend to disappear over time. Maintain order for pencils and rulers on a desk but bring out the colorful addition to the cinder block by placing it next to a bouquet of flowers that complements the decorative paint that’s been added. Wherever this cinder block organizer lands, it's sure to bring convenience, charm and creativity into the home. 1. 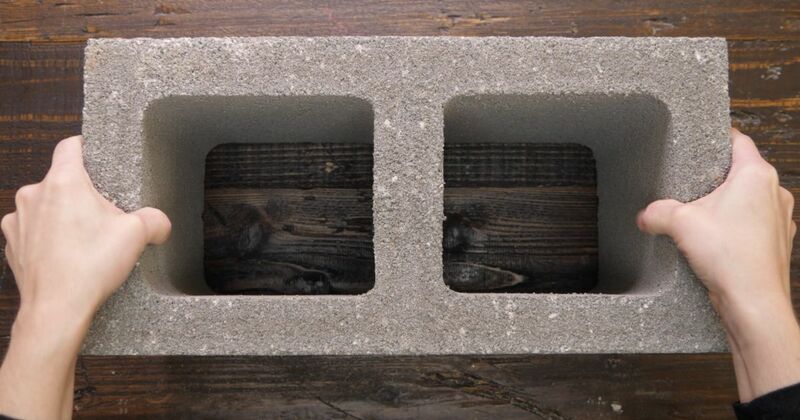 Place a cinder block on a flat surface horizontally so one of the long surfaces without holes is facing up. 2. Apply a decorative stencil one inch from the left edge of the cinder block and tape securely to the surface using painter’s tape on all four edges of the stencil. 3. Fill a glass cup with light blue paint and cover the surface of the stencil using a small paintbrush. 4. Remove the stencil and painter’s tape, and repeat the process on the right end of the cinder block using light pink paint. 5. Rotate the cinder block so the two holes are facing up and the stenciled surface is facing out. 6. Paint the inside of the left hole with blue paint using a large brush. Paint the interior of the right hole with light pink paint. Leave the top edge of the cinder block unfinished and let the block dry. 7. Place the cinder block on a desk next to a floral bouquet with the decorative stenciling facing out. Fill the cinder block holes with rulers, pencils and pens.